We here, at The Hive Honey Shop, are very excited to have found beekeepers that make amazing hand made honey sweets! You can meet them in person here at the shop this Saturday November 28th 10am-5pm (or until all the chocolates sell out!) Here’s a brief on them and why we are so excited to add them to our honey range! 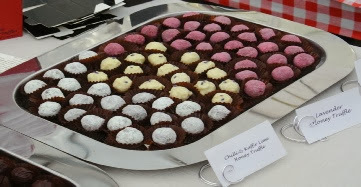 Our first offerings were our honey truffles. They’re full of the goodness our bees bring home from the fields and woodlands around us, and are made simply from inspirational chocolate, honey, local cream and butter. 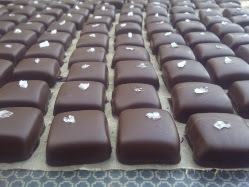 We then added to our range with honey and sea-salt caramels which are dipped in seventy per cent dark chocolate. They’ve proved utterly irresistible, and are flying out of the door. New Season Honey, Bullace Gin, Plum & Brandy, Cobnut Gianduja, and Boozy Cherry. Come meet the ‘Chocolate Beekeepers’ and try some of their amazing delights. As well as this, the whole of our Northcote Road will be BUZZING! Don’t miss the Christmas shopping event this Saturday 30th November. Parking bays along the length of Northcote Road will be suspended and there will be 45 visiting traders to take part in the festive shopping day. There will be an array of stalls from photographers to cake stalls and handmade furnishings to cosmetics. Many shops along Northcote Road will be providing some further festive cheer with such offerings as mulled wine, hot chocolate, cooking demos, street entertainment and other activities.